Google Slides is an online presentation app that allows you to easily collaborate and share presentations that include text, photos, audio or video files. Similar to Microsoft's PowerPoint, Google Slides is hosted online so that the presentation can be accessed on any machine with an internet connection. You access Google Slides in a web browser. Google has created a set of office and education applications that are similar to the tools found in Microsoft Office. Google Slides is Google's presentation program that is similar to Microsoft's presentation tool, PowerPoint. Why would you want to consider switching to Google's version? One of the main advantages of using Google's tools is that they are free. But there are other great reasons too. Here's a quick look at some of the basic features of Google Slides. Do I Need a Gmail Account? A screenshot of the Google account page demonstrating that both Gmail and non-Gmail accounts can be used to create a Google account. No, you can use your regular non-Gmail account. But, you will need to create a Google account if you don't have one already. To create one, go to the Google account signup page and get started. Is it Compatible with Microsoft PowerPoint? Screenshot of Google Slides showing the File tab option to save in different formats, including Microsoft PowerPoint, JPEG and PDF. Yes. If you'd like to convert one of your PowerPoint presentations to Google Slides, use the upload feature within Google Slides. Your PowerPoint document will automatically be converted into Google Slides, with no effort on your part. You can also save your Google Slide presentation as a PowerPoint presentation, or even a PDF. A screenshot of the Settings within Google Slides for the offline option. Yes and no. Google Slides is cloud-based, which means you'll need Internet access to create your Google account. Once you have created your account, Google offers a feature that gives you off-line access, so that you can work on your project offline. Once you are connected to the Internet again, all of your work is synced to the live version. A screenshot of the Google Slides option to add email addresses of collaborators. 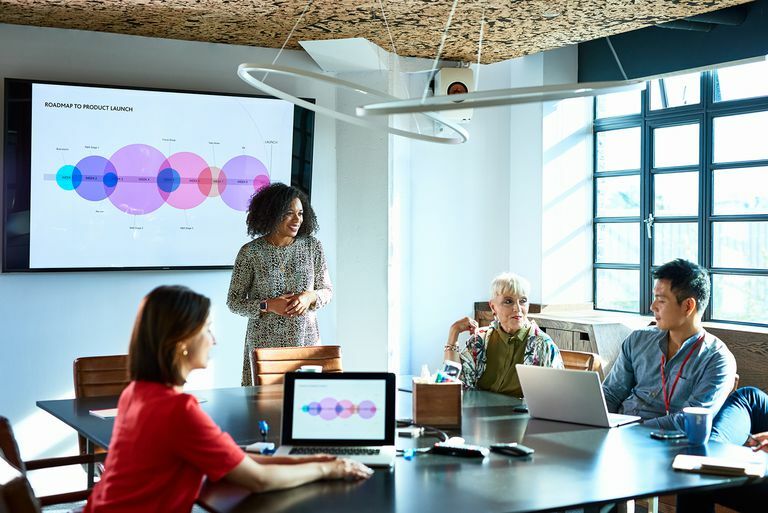 One of the key advantages to Google Slides over Microsoft's PowerPoint, is that Google Slides allows live-team collaboration, regardless of where your teammates are located. The share button on Google Slides will enable you to invite multiple people, through their Google Account or Gmail account. You control what level of access each person has, such as whether the person can only view or edit. Sharing the presentation allows everyone on the team to work, and view, on the same presentation simultaneously from satellite offices. Everyone can see live edits as they are created. For this to work, everyone must be online. A screenshot of the Google Slides option that allows opens the version history within the File tab. Because Google Slides is cloud-based, Google is continuously auto-saving your presentation while you are working online. The Version History feature keeps track of all changes, including the time, and who made the edit and what was done. A screenshot of Google Slides custom theme options. Just like PowerPoint, Google Slides offers the ability to use pre-designed themes, and features that come with coordinating colors and fonts. Google Slides also provides some nice design features, which includes zooming in and out of your slides and the ability to apply masks to images to modify their shapes. You can also embed a video into your presentation with a .mp4 file or by linking to an online video. A screenshot of the Google Slides option to publish to the web, with the option to use a link or the embed code. Your Google Slides presentation can also be published on a webpage through a link or by embedded code. You can also limit access to who can see the presentation through permissions. These are live documents, so whenever you make a change to the Slides document, the changes will also appear on the published version. Both. Because Google Slides is browser-based, the platform you work from makes no difference. This feature allows you to work on your Google Slides project at home on your PC, and pick up where you left off back at the office on your Mac. Google Slides also has an Android and iOS app so that you can work on your presentation on a tablet or smartphone. This also means that any collaborators are free to use a PC or Mac as well. When you're ready to make your presentation, you are not limited to the computer. Google Slides also can be presented on an Internet-ready TV with Chromecast or Apple TV. Now that we've looked at the basics of Google Slides, it's clear that one of the most significant advantages to this presentation tool is the ability to handle live collaboration. Live collaboration could be a big time-saver and make a dramatic difference in the productivity of your next project.